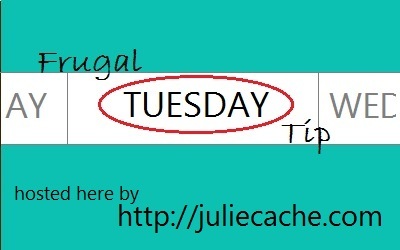 What is the Frugal Tuesday Tip? Anyone with a frugal tip can share. Just post a frugal tip on your own blog, then come here to add your post (the permalink) with the linky tool. The topic of frugality is pretty wide. We only ask that you keep everything Rated G.
Your post will appear on all of our blogs! You can also share some internet love with our Frugal Tuesday Tip button. Just copy and paste the code below the button and add the button anywhere in your post in the html view. You could also put a “text” widget (WordPress) or an HTML gadget (Blogspot) in your sidebar. Thank you for spreading the word! Everyone can follow the submitted links and find new ways to embrace the frugal life. Not a blogger? NBD! (No Big Deal) Leave your frugal tip in the comment section. The linky will be open until Sat., Jan. 29.